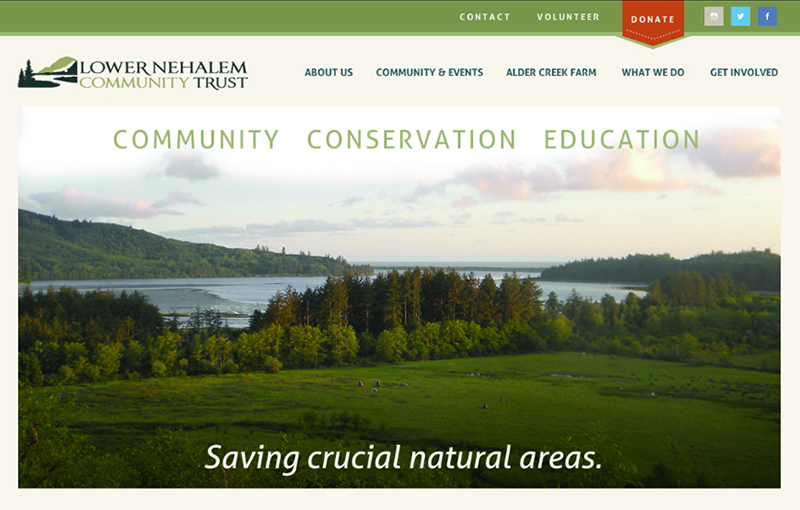 Lower Nehalem Community Trust is a small non-profit with big heart. They are charged with preserving land, nurturing conservation values, and working with an engaged community in the Nehalem region of the Oregon Coast. Their tagline is community, conservation, education. Community: Their flagship property, Alder Creek Farm, has a community garden, greenhouse, nature trail, plant nursery, and wildlife sanctuary. Conservation: Their land is extensive, and the site includes a slick interactive land map, which shows the region they protect, and includes stories about each parcel of land. Education: They offer summer camps and school programs. ruby slipper had the honor of working with Dale, their visionary director. Rob, a Portland rock star, who helms memberships and donations. Mary, the office manager with a keen eye for design, and Brenda Cornett of BrandVIVA, who created the beautiful logo and brand identity. This site features a custom WordPress theme, created by Happy Dog Web Design.